Eleven weeks have passed since my Dad died. After the funeral, I took a day off and then went back to work. I have not had significant time off since then. That is one of the reasons I am looking so forward to this week. On Tuesday, I will be traveling back to Wichita, Kansas for Gathering 3 of the Apprentice Experience. For the next four days I hope to be renewed in my thinking, to be refreshed in my spirit, and to reflect on what has been an incredibly difficult 2017. I want to rest and to enjoy being around some of the best people I know. At the end of the week, our group will converge with a national conference called the Apprentice Gathering. It should be an incredible time. I am sure I will have the chance to report on some of what I have learned in future posts. I want to thank all of you who read the blog and have reached out to me and prayed for me. Your support has been so encouraging and life giving. If there is any way I can return the favor, please let me know. Thank you. What if The Gospel is Greater Than We Imagined? 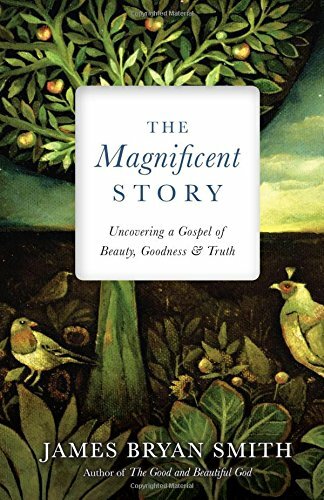 One of our readings in preparation for the third gathering of the Apprentice Experience is The Magnificent Story: Uncovering A Gospel of Beauty, Goodness, and Truth by James Bryan Smith. I am so privileged to actually know Jim and to have shared meals with him and chatted with him about his work and about some of my meager efforts at discipleship and spiritual formation ministry. This is a guy who had Rich Mullins as a tenant in his house and was designated by Dallas Willard to write a Curriculum of Christlikeness. But after reading The Magnificent Story, I am especially blessed to be associated with his ministry as a participant in the Apprentice Experience. This book, though not shy on theology and some scholarly heavy lifting, does for the Gospel what Dallas Willard’s The Divine Conspiracy did for the Kingdom of God. If you thought you knew all their was to know about the Gospel, Smith would say that you have just been exposed to a reduction and not the magnificent story full of goodness, beauty, and truth. He looks at reduced gospels such as the social gospel or the penal substitution gospel as important theological points but because they are reductions have become distortions that are doing more harm than good. As an alternative, Smith emphasis the Trinity as something we lose when our gospel gets distorted. He also mentions things like the miracle of creation, incarnation, and the great end of the story when we will see the new heaven and the new earth. I have been exposed to Smith’s writing enough to know that he is not interested in hype. His book, though a departure, in many ways, from tried and true narratives coming out of evangelical circles, is meant to expose people to the vast expanse and wonder of God and his work on earth. He is not trying to present some counter view just to sell books or create a social media buzz. He has felt compelled by the Holy Spirit to write this book and the two books that will follow this one – The Magnificent Journey and The Magnificient Mission. Our culture is so full of outrage, so full of narrow-mindedness, so full of criticism that I wonder if we are allowed to enjoy anything anymore. Smith reminds us that God and his work is worth enjoying and is intended to be enjoyed and now is the time to start enjoying God’s magnificent story. I am 42-years old. I now have a daughter who is a Freshman in college. I recently tried to write some things to her detailing what I wish I knew entering college. That got me thinking about myself as a young person and what would have been important to know when I was 20-years old. Here is a portion of that list. Pursue Christ not feelings. I once spent time at a lake talking to God about all that I wanted to experience. I began most of my sentences with, “I want to know what it feels like to…” Looking back on that now, I am frightened by my foolishness. By God’s hand I didn’t fall into some self absorbed, emotion only fueled existence that only sought feelings at the expense of the transforming power of Christ and the conviction of the Holy Spirit. Christ is much more worthy of pursuit than my feelings. The latter is a dead end. Being a Contrarian has its limits. I am one of those people who in a room full of liberals will be the most conservative in the room or in a room full of conservatives will be the most liberal in the room. I am not intentionally trying to be difficult, it is just that too much blind consensus makes me uncomfortable. So, in the evangelical world that I grew up in and continued to partake of in college, I tended to narrow my faith to a set of beliefs that were more personal preference than a soul stirring philosophy of life. More a reaction to what I saw around me than a productive sense of direction. In a way, I had been guilty of the same problems I saw in my evangelical circles. In an effort to be reactionary against what I thought were a narrow set of beliefs, I had built up my own reduced version of beliefs. The depth and breadth of the full gospel were lost to those I was reacting against and to myself. Change is Possible. Twenty plus years later I am a different person. Many people hold back on this Growing Up in Christ thing because they don’t really think that change can happen. I can say that Christ has transformed my life but at 20-years-old I would have been skeptical. Today, I am a friendlier and more patient person. I am less selfish. I don’t let anger and bitterness consume me. I am more genuine and less likely to embrace falseness and pretense. Lust doesn’t have the hold on me as it once did. I understand more of the heart of Christ and have been able to learn from him in a variety of ways. It is not as important for me to always be right. Christ can change lives. It has happened to me. The sum of God’s purpose for human beings is to love one another. No filter is needed. You don’t have to run this through a denominational filter, or a political filter, or a theological filter, or a family filter, or a social media filter. This is a biblical directive, it is right there in black and white. The mark of Christianity is whether we are loving our neighbor as ourselves. You don’t need someone to tell you what this means and whether or not one thing counts as loving your neighbor and one thing doesn’t. If you are a Christian and you don’t know what love looks like, then you might need to start your faith over. This past week in Houston, there have been many signs of this kind of love for neighbor. Volunteers in boats are saving people from their washed out homes, public service personnel are risking their lives and maybe even the protection of their own home and possessions to help others. And we are celebrating these acts of sacrifice and love. The stories about heroes are more present on social media than stories of destruction or loss. We can’t get enough of it. Why? Because, deep down we know the goodness that is found in this kind of love. We recognize the purity of helping another person simply because they need help. May Christians return to this truest mark of the faith. Let us put away all of our filters that give us convenient excuses for not doing God’s will. Life is too short to not love, to not practice goodness. Let us live a filterless life.